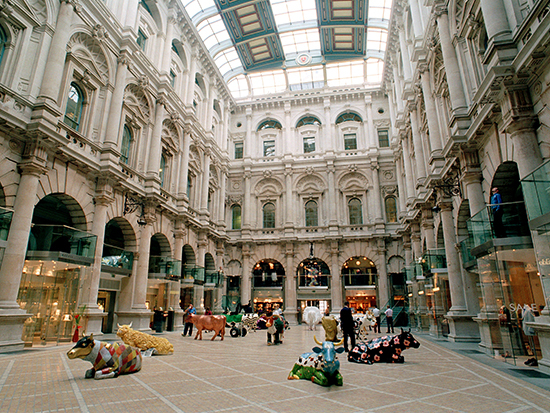 Located in the heart of London’s business centre, adjacent to the Bank of England, the Royal Exchange is steeped in history and tradition. Built in 1884, this Grade I listed building is one of the most important in London’s history, and now houses a number of exclusive boutiques within its’ central covered courtyard area. Working with architectural metalworkers, Optima Architectural, Kite Glass was commissioned to supply the toughened glass panels for this prestigious project. The design and age of the building posed many questions for Kite Glass technical staff, and in order to maintain site lines, levels and squareness, accurate manufacture to very close tolerances was necessary. Pilkington Optiwhite low iron glass in 10mm, 12mm and 15mm thicknesses is used throughout for the shop fronts and entrances, allowing the shops to demonstrate the true colours of the items on display, as well as achieving maximum light transmission. 15mm toughened and heat soaked Optiwhite was also used to fill in the first floor arches at each end of the building – a particularly difficult project given the size, shape and accuracy required to fit the glass around the old stonework. 19mm clear float toughened, heat soaked glass was specified for the structural stairs and balconies over each shop front.